My bottle of Kahlua was wondering why I hadn’t used the rest of it, so I searched around for something that included it. I found an interesting cocktail in Viva Margarita , but I didn’t really like the name for it in the book. 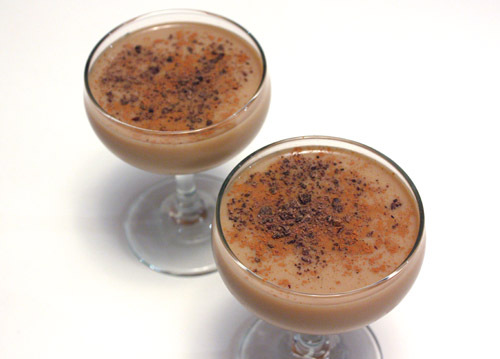 It’s made with espresso, tequila, and Baileys Irish cream in addition to the Kahlua, but the name ‘Tijuana speedball’ didn’t seem to do justice to all those great flavors. I wanted to call it ‘an Irishman woke up in Mexico’ but decided that sounded like the beginning of a joke, and I didn’t have one to go with it. Friends and family all tried to suggest other possible names, but nothing seemed quite right. I gave up just now, and went with the name you see above. Send me a better idea if you have one. Throughout the book, the drink recipes are written for either one or two drinks. In this case, it was for one. I made slight changes and will give quantities below for two drinks as I made them. The suggested garnish was to float espresso beans on the top surface with some cinnamon. Instead, I finely chopped chocolate-covered espresso beans and sprinkled that on top with a dusting of cinnamon. Because this is a chilled cocktail, I brewed the espresso in advance and left it in the refrigerator for about an hour. 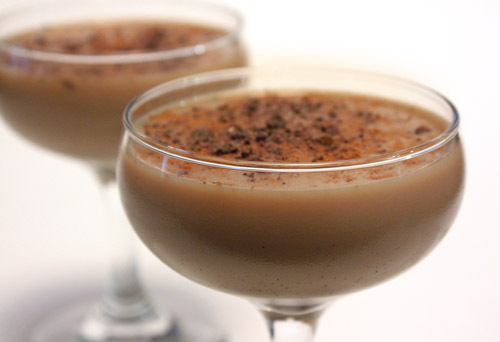 The hint of caramel from the Kahlua and the smooth Baileys added just enough sweetness to the espresso and tequila. A small, six ounce serving was just enough for a caffeine jolt with a kick, and the dusting of cinnamon and crushed chocolate-covered espresso beans on top was delicious. I’ll definitely be mixing more of these, but what should I call them next time? Add a handful or two of ice to a cocktail pitcher (or shaker) and then pour the tequila, Kahlua, Baileys, and espresso over the ice. Stir (or shake) to blend and chill. Strain mixture into two six ounce cocktail glasses and sprinkle tops with cinnamon and chopped chocolate-covered espresso beans. I like ‘an Irishman woke up in Mexico’ . Maybe after a few of those it'll even be funnier. They sound gorgeous. I'm after trying one tomorrow if I can get all the ingredients. Wow!!! I can definitely go for one of these right now. Perfect ending to a busy day. It's just about time for happy hour. Yum!! The kind of cocktail i would adore! I wonder if it would pair with corned beef tacos? I soooo like this! Especially because cocktails get me sleepy -- all that hard liquor and all. But with the espresso in it, I won't have that problem. Genius! That is a serious cocktail. I thought I had leftover kahlua, but my friends apparently drank it all...oh well. Espresso, khalua, baileys... all are my favourites!! Hey, just wanna ask, after I make my baileys shake, i topped off with Choc Powder.. When we drink from the glass, most ppl will get chocked from the powdery choc powder..
Am I using the wrong type of choc powder? Wow, I'd love one of those cocktails. A delightful dessert!! I so love Kahlua!! It looks gorgeous and as for a name.... well, I am notoriously bad in coming up with good names, so can't help you there! I love those coffee bean shots! Wow looks so good for a cold evening in Spring. I love Mad mad ,TV show, and in the official site of the series I read about some old fashion(but some always in fashion ) drinks . this reminds one named Alexander. This is a great drink, I have all ingredients at home except the expresso beans, guess can be subsituted. Thanks for sharing the recipe. Must try one evening for a treat! 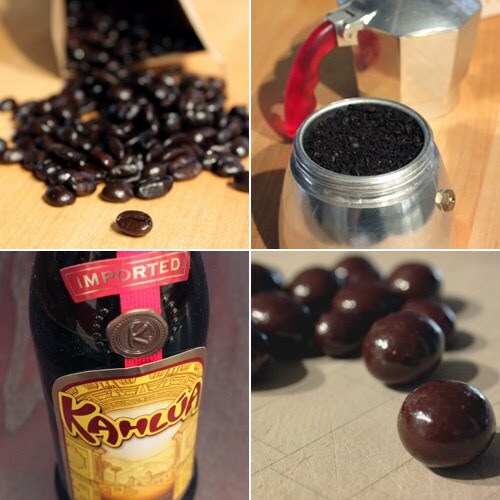 Espresso Kahluarita? LOL, that doesn't sound very good. I am bad at naming things. Hehe. The drink sounds amazing, though. Fabulous! I can make this with my Sheridan's that has both irish cream & coffee liqueur! The crushed chocolate covered espresso beans is a nice touch! I think I would go with A Leprechaun in Tijauana. You mixed every single one of my favorite drinks together in one lovely glass. Amazing! Thanks for sharing. You cant beat chocolate :), gorgeous presentation. I like melinda's title "a leprechaun in tijuana" very cute. Nice use of the kahlua! Looks perfect for the cool weather! YUM! I love the use of chopped up espresso beans - what a perfect compliment! This is one knock out concoction! I had Irish whiskey in coffee before but not with kahlua. Love the name as you had given it & I'd have this drink anytime! This looks amazing! I think I'll make it for my husband and I this weekend! What a delicious drink! There will be no napping after this one! These look amazing! I have everything but the tequila, which I'll have to pick up! I haven't even had a sip and I'm all giggly about this drink! I like the name you chose and although it really does sound like the start of a joke, the "An Irishman woke up in Mexico . . ." title would've been funny, too! I say, just call it wonderful! But can this be made into a creamy, pudding-like dessert? Just askin'! Holy cow! This looks delicious, and there's no way, I'd be an insomniac after this delicious drink! Now this is one for me! will make my hubby do this for me. ...I believe this is called a "Tijuana Speedball"....i like your addition of the finely chopped chocolate expresso beans.. yum..yum!